Organizations are recognizing that social workers often put themselves in harm's way while on the job and must be trained to protect themselves and learn how to create safer work environments. What do you consider a dangerous profession? Law enforcement? Firefighting? Serving in the military? What about social work? Social workers often put themselves in harm's way to help clients—making home visits alone in unfamiliar neighborhoods, serving people with serious mental illnesses, and finding themselves involved in potentially violent family dynamics. Today, workplace safety is of increasing concern to professionals in all sectors of society, and social work is no exception. In response, advocates for social worker safety are urging their colleagues to become more aware of the risks of their profession and learn what they can do to create safer working environments. "In every single work setting, in every neighborhood and socioeconomic group, violence can occur," says Eva Skolnik-Acker, LICSW, consultant to a workplace safety training program operated by the Massachusetts chapter of NASW. "Every social worker and human service worker can be a victim of aggression at some time during their career." Many social workers are employed in settings that can put them at significant risk for job-related violence. A report from the Occupational Safety and Health Administration (2015) revealed that nearly three-quarters of the workplace assaults that occurred each year between 2011 and 2013 took place in a health care or social services setting. The vast majority of these assaults were nonfatal but resulted in serious injury and time away from the job. NASW partnered with the Center for Health Workforce Studies at the University of Albany in 2004 to study 10,000 licensed social workers to find out more about their experiences in the workplace; 44% of the social workers who participated in the study reported that they faced personal safety issues in their primary employment practice, and 30% of these social workers did not think their employers adequately addressed the safety issues (NASW, n.d.). 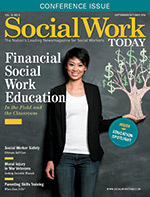 The NASW research found that social workers facing safety issues were more likely to have 10 or fewer years of experience in the profession, work at social service agencies, and focus on the practice areas of mental health or child welfare/families (NASW). These social workers also were more likely to practice in nonprofit or state government settings. Acknowledging that more needs to be done to protect social workers in the workplace, national professional groups have increased their efforts to make social worker safety a priority. For example, NASW has a special page on its website (www.naswdc.org) devoted to safety; the page includes links to various resources, including articles, guidelines for social worker safety, tips for organizing for office safety, and information about workplace safety legislation enacted in several states. NASW also has an online memorial to social workers who lost their lives while performing social work duties. In addition, the Council on Social Work Education recently added language to its field mandates requiring schools of social work to describe how their field programs specify policies, criteria, and procedures for supporting student safety (Lyter, 2016). NASW's Massachusetts chapter (NASW-MA) has taken on a leadership role nationally in promoting workplace safety for social workers. One part of the chapter's efforts is its Workplace Safety Training Program. The program provides training to social service organizations through a curriculum that covers issues such as assessment of risk factors, verbal de-escalation, developing safety plans and policies, violence prevention, and dealing with the aftermath of violence. In addition, NASW-MA assisted in efforts to get a bill passed that requires all programs that are operated, licensed, certified, or funded by a department or division of the state's Executive Office of Health and Human Services to have workplace violence prevention and crisis response plans. Massachusetts Gov. Deval Patrick signed the legislation in 2013. "There's a lot of interest in what Massachusetts is doing on a statewide level," Skolnik-Acker says. "Once the conversation got started, it really took off like wildfire. Our employees really wanted to get involved in talking about this," Brooks says. "A lot of our employees are going above and beyond in situations where their passion is leading the charge, but we must not forget the aspects of safety. We have to come back and remind people that there are risks and what these risks look like and how they might present themselves." Awareness of safety issues is growing not only among social workers and human services organizations; it also is being heard by businesses that seek to support social workers. The exhibitors at the 2016 NASW national conference in Washington, DC, included companies that market technology products that workers can use to alert authorities if they find themselves in dangerous situations. Texas-based AlertMedia was at the conference to market its SafeSignal product. SafeSignal is a smartphone-based product that, when activated through an app, emits a loud audio alarm and alerts authorities when a bright yellow tether plugged into the phone's audio jack is pulled out. AlertMedia is marketing SafeSignal to social work organizations and plans to start making it available to individual social workers later in 2016, says Brian Cruver, AlertMedia's CEO. Cruver believes SafeSignal is attractive to social workers because it allows them to call for help without having to unlock or otherwise fiddle with their phones, "Just having to start these SafeSignal sessions [on their phones] gives the workers a feeling of safety and control over the situation," Cruver says. "They feel safer; they feel that we're with them, that they're no longer alone." Despite the increasing attention being paid to violence in the workplace, safety advocates often find that one of the biggest hurdles they face in trying to get social workers to take safety more seriously is the social work profession itself. Many social workers don't recognize workplace violence as an issue that affects them, Skolnik-Acker says. There are several reasons for this attitude, she adds. One reason is that many social workers were not taught about safety as part of their training. Another factor is that some social workers only associate violence with work activities that are considered high risk, such as home visits, and don't see it as a professionwide issue. Some social workers are critical of colleagues who are victims of violence, believing that the workers are inexperienced or somehow to blame for doing something wrong or lacking good judgment. Many social work organizations have a false sense of security when it comes to worker safety, says Chad Dion Lassiter, MSW, president of Black Men at Penn School of Social Work Inc., which works to recruit black men into the social work profession. These organizations believe that because they haven't had an incidence of violence in the past that they are not likely to have one in the future. That's a dangerous assumption to have, Lassiter says, especially when you think about how little protection social workers typically have working in the same situations as their counterparts in law enforcement. "Social workers go into some of the same communities as the police. But we're just going in with just a briefcase, a manila envelope, and a computer," Lassiter says. Alena Gerst, LCSW, RYT, knows firsthand the stress that can be caused when a social services organization ignores issues of safety. Gerst used to work for a residential facility for chronically homeless adults, many of whom were battling substance abuse and mental health problems. According to Gerst, the workers had emergency buttons at their desks that did not work, were segregated from administrators who worked behind secured doors, and often had to do things that made them feel unsafe, such as transporting clients. The workers raised their concerns about safety at every staff meeting but were routinely ignored, says Gerst, who now works at a hospital in New York City. "The staff didn't feel safe, and safety was not a priority for the administration," she says. "For many of us, it got to the point that our families worried about us." Many social workers' attitudes about safety are influenced by their past experiences in field placements, says Sharon Lyter, PhD, LCSW, a professor in the social work department at Kutztown University of Pennsylvania. In a book chapter in a recently published book for field directors (Lyter), she describes some of the roadblocks students can face when they ask more experienced social workers for advice about safety issues. Some students will be ignored, while others will encounter veteran social workers who will tell "war stories" about their own risk-taking. Still other students will be told that their own biases are contributing to an irrational fear of clients. Lyter believes these responses don't necessarily mean that veteran social workers do not share students' concerns about safety. Instead, some social workers at schools of social work or in field placement settings are afraid that talking too much about the potential for violence will scare students away from the profession or raise unwanted questions about liability. "For some people, [the topic of safety] is really unwelcome," Lyter says. "It's just one more thing to think about." Brooks says he understands why some social services agencies may be wary of discussing safety with employees, so how the discussion is framed makes a difference. Instead of approaching the discussion in a way that makes employees fearful, agencies should present the discussion as a way to enhance the work environment and make employees more effective. Lassiter agrees that the tone of the discussion is crucial. "Even though we are service providers, we have to take care of ourselves and ensure that the environment is safe," he says. "If there aren't any security measures in place, we can't necessarily provide the best service." There are many actions agencies can take to ensure the safety of their employees. Among the actions Lassiter recommends are developing a safety manual that outlines what staff should do during an incidence of violence, having regular shelter-in-place drills, hiring security personnel, and establishing relationships with area police authorities and mobile crisis teams. In addition, organizations need to have policies that explain how the organization will help employees who are victims of violence and how it will address the needs of new employees who previously have been victims of violence. Schools of social work can play a role, as well. Training on issues such as compassionate listening and conflict resolution should start at the undergraduate level, Lassiter says. Field education programs should incorporate safety training into their curricula and consider not working with agencies that do not have specific policies about how they will keep students safe, Lyter says. She also believes that academic researchers could help by studying which violence prevention and safety intervention practices are most effective. Social workers must consider the type of culture they are creating every time they interact with clients and whether that culture promotes safety or encourages violence, says Simon Zeller, LICSW, founder of Cedar House Inc., which provides outpatient mental health services in southern Minnesota. Zeller says some social workers have strayed from radical acceptance of clients and instead try to impose community norms on them, which creates a source of tension that can escalate to violence. The key, Zeller adds, is to create a climate of kindness, humility, passivity, and tolerance that rejects aggression on the part of both employees and clients. For example, Cedar House has a policy that employees are not allowed to physically restrain clients. Clients are told that they will be no longer be able to receive services if they are hostile toward employees or other clients. "We talk safety in terms of all of us. You must feel safe in the building to grow as much as you can. If you don't feel safe, you're not going to grow well," Zeller says. "We don't have to tell the clients to be kind; the other clients tell them to be kind. It's about creating that culture." Ultimately, individual social workers cannot rely on their employers alone to promote workplace safety. Each social worker must take a stand and advocate for safer working conditions, Skolnik-Acker says. This advocacy begins by recognizing safety as a legitimate issue and raising awareness among other social workers. Gerst advises social workers to ask both their current employer and any prospective employers about what they are doing to promote safety. Unions also could be good resources if a social worker is employed by an organization that has one, Gerst adds. Social workers who are concerned about safety should always remember that bringing the issue up with their employers, other organizations, and government officials does not mean that they are admitting insecurity or immaturity, Skolnik-Acker says. "Listen, we have to pay attention to [safety]. There's enough data out there to show that this is a real issue," she says. "Don't be apologetic for bringing this up." Lyter, S. C. (2016). Safety and risk management. In C.A. Hunter, J. K. Moen, & M. S. Raskin (Eds. ), Social work field directors: Foundations for excellence. (pp. 218-237). Chicago, IL: Lyceum. National Association of Social Workers, Center for Workforce Studies. (n.d.). Social workers and safety. Retrieved from http://workforce.socialworkers.org/whatsnew/safety.pdf. Occupational Safety and Health Administration. (2015). Guidelines for preventing workplace violence for healthcare and social services workers. Retrieved from https://www.osha.gov/Publications/osha3148.pdf.